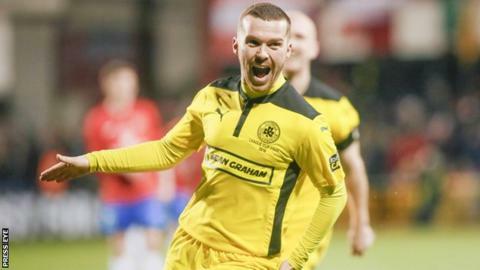 Cliftonville became the first club to win the League Cup four years in a row by beating Ards in Saturday's final. Winger Martin Donnelly scored the first with a low curling accurate shot from outside the box in the 35th minute. Just before half-time Ards keeper Ryan Brown made a brilliant save from striker David McDaid's penalty. McDaid did make it 2-0 on 62 minutes by turning the ball in from about six yards and late on sub Stephen Garrett wrapped it up with a close-range third. Seconds before Donnelly had netted the opener, Ards fluffed a great chance to take the lead when Jordan Baker put a six-yard header wide. And, just after going 2-0 down, Ards half-time substitute Stephen O'Neill went close to scoring against his former club but saw a header cleared off the line. The historic win also brought a first trophy for manager Gerard Lyttle, who last October took on the job of succeeding Tommy Breslin, the north Belfast club's most successful manager. Breslin, who had guided the Reds to eight trophies, stood down after Cliftonville's early-season league form stuttered. Lyttle, with Celtic for a spell as a player, took over originally on a temporary basis. But, after a promising start results-wise, the Solitude board gave Lyttle the full seal of approval and they will feel vindicated by this success. Ards had gone into the final as massive underdogs, even more so having agreed to play on their opponents' ground, rather than a neutral venue, to benefit from bigger gate receipts. Manager Niall Currie's main target is to get the North Down club, who were relegated in April 2014 and haven't had their own ground since the late 1990s, restored to the top flight of the Irish League. They will feel heartened. by giving a good account of themselves when the odds were stacked against them, and will be many people's favourites to go on and win the Championship One title. Cliftonville manager Gerard Lyttle: "We told the lads to play themselves into the history books. "Winning is everything to me and you have to get trophies at this club. "I cannot believe it, winning as a manager is completely different. "All the hard work pays off when you get a trophy at the end of it all." Cliftonville's David McDaid: "It was great to score in the final after missing it last year. "The keeper made a good save from my penalty and the lads kept me head up at half-time. "This is history for the club, the whole team played well and I'm thrilled to be part of it."